Color is one of the fundamental properties of all symbols and map elements. 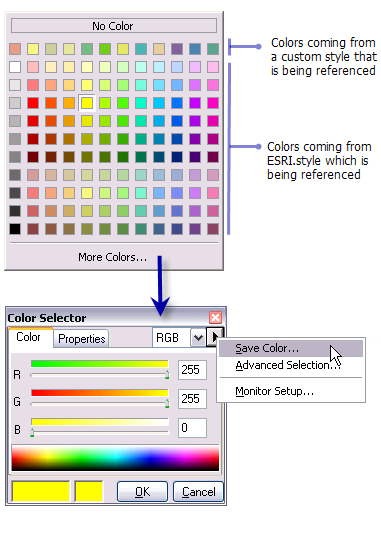 A color palette is available on many symbol-related windows. It shows all the colors available in the currently referenced styles. You can pick a color from the palette or define a new one. You can create new colors for symbology as you work by right-clicking the symbology in the table of contents or by clicking the Color drop-down menu on a dialog box. Color drop-down menus are found on dialog boxes such as the Layer Properties dialog box, the Symbol Selector dialog box, the graphics Properties dialog box, or the Label Manager dialog box. Choose a different color or click More Colors to view additional colors. Use the Color Selector dialog box to mix a new color if you choose More Colors. Click the Arrow button and Save Color to save the new color. Type a name for the new color. The color is saved in your personal style. If the style that you want to add colors to is currently referenced, it will be listed in the left pane of the Style Manager dialog box. Open the Colors folder. If colors are already present in this style, they will be listed here. On the context menu that opens, click New and click the appropriate color model. The Symbol Property Editor dialog box opens. Click a color in the Color window or use the color model spinners to mix a color. Type the name of the new color in the Contents dialog box. A null color lets you create transparent areas in your symbols. It also lets you turn off outline drawing. To define a null color, you set the property for Color is Null. A null color can't be used to knock out or block other colors. You can use the Eye Dropper tool to identify the RGB values of any color on your map and save the color to your personal style. From the Customize menu in ArcMap, choose Customize Mode to open the Customize dialog box. Click the Commands tab and navigate to the Page Layout category. Drag the Eye Dropper tool onto any toolbar. 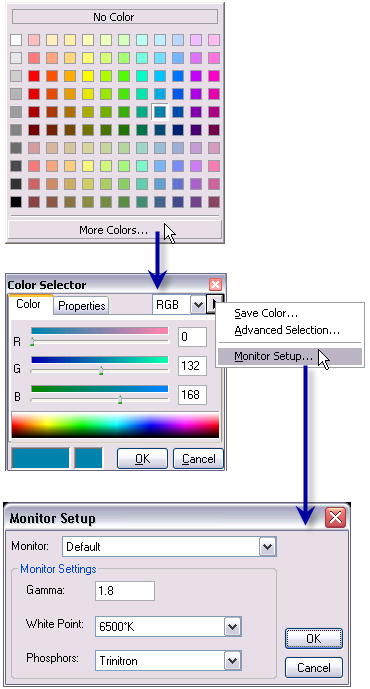 The Monitor Setup dialog allows you to adjust the visual appearance of colors in ArcMap as they appear on your computer monitor. On the Monitor Setup dialog box, use the Monitor control to specify the display device. The Gamma response factor is used as a ‘power’ in adjusting the proportion of the input voltage and output luminance; enter an integer between 1 and 3. The White Point modifies the input light source factor. The light source temperature is measured in Kelvins. 6500 K produces a constant light, independent of external influences. In the Phosphorus menu you can choose Custom to input personal settings.